Five decades ago, soon after we founded our Florida personal injury and accident law practice, Babbitt & Johnson P.A. became the first attorneys in Palm Beach County to obtain a million-dollar verdict in a personal injury matter. That got our client the relief they deserved - and it got us on the map. In the years that followed, we've won numerous multimillion-dollar verdicts and settlements, in matters including medical malpractice, auto accidents, products liability, drug litigation, commercial litigation and other mass tort and personal injury matters. We've obtained some of the largest recoveries ever seen in Florida - and helped our clients out of difficult times. Since that first memorable win, our reputation and our track record has grown, but one thing remains the same: our commitment to each client. Our partners handle every case themselves; they never farm out work to a less experienced lawyer. And they take on cases only after careful consideration and investigation. That lets us devote the resources each case needs - and each victory demands. Other lawyers are quick to settle, because that's the easiest way for them to move on. We'll go all the way to trial, if necessary. Because that's the only way our client can move on. And that's what makes us a different sort of law firm. Your best interests get our best efforts. 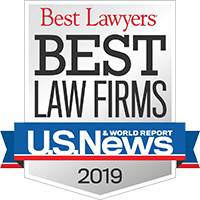 We’ve been distinguished by Best Lawyers®, the oldest and most respected peer-review publication in the legal profession, for six consecutive years. Firms included are recognized for professional excellence with persistently impressive ratings from clients and peers. Achieving a tiered ranking signals a unique combination of quality law practice and breadth of legal expertise. Since opening our doors in 1967, we have built our reputation one case and one client at a time. And after five decades, there's a lot to show: recoveries - and personal service - that have won us the respect of those who come to us for help; honors from peers in the Bar and judges on the bench, who have bestowed upon our firm the highest possible rating for legal ability and ethics. Our founding partner, Theodore Babbitt, is a member of the Inner Circle of Advocates, an invitation-only group limited to 100 top plaintiffs' lawyers in the United States. He has been named to the International Academy of Trial Lawyers, a group of just 500 of the world's preeminent trial lawyers, and is a member of The American College of Trial Lawyers, one of the field's most prestigious and selective associations. Mr. Babbitt is one of just a handful of lawyers who have been named to all three of these prominent organizations - and has been listed in The Best Lawyers in America every year since that publication's inception. Our other partner, Joe Johnson, has also received numerous accolades from legal and professional organizations, as well as his peers. He has a long record of taking on complicated cases - and obtaining significant recoveries - and is Board Certified in Civil Trial Law - a qualification given to just 2 percent of lawyers in Florida. He’s been selected to Super Lawyer for the past 10 years and was selected by his peers for inclusion in The Best Lawyers in America© 2016 in the field of Personal Injury Litigation- Plaintiffs. From commercial disputes to serious injuries, the lawyers of Babbitt & Johnson P.A. handle each case with the same expertise and integrity that have defined their career - and made their name.